Black Turmeric PlantUses of Black Turmeric Black turmeric is an auspicious herb. It has metaphysical properties. So it is used in Kali and Durga Puja. People keep black turmeric plants and rhizomes in their house for good fortune. It is believed that it removes all the negative factors from the surroundings at where it is kept. Curcuma caesia is a medicinal herb, useful in leucoderma, asthma, tumors, tuberculous glands of the neck, piles, bronchitis, and enlargement of the spleen. Green Earth Products is one of the leading supplier of Curcuma Caesia/kali haldi. Green Earth takes great care in packing, sealing and handling to ensure long life quality. As per the needs and requirements of our clients, we are involved in providing Black Turmeric. 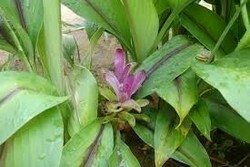 Black Turmeric (Curcuma caesia) is a perennial herb with bluish-black rhizome, native to North-East and Central India. To serve the requisite requirements of our precious customers, we are engaged in providing a qualitative range of Kali Haldi. We are one of the well-distinguished companies in the market that are into offering Black Turmeric. Owing to the rich industrial experience and expertise in this business, we are involved in providing Black Turmeric. To accomplish the numerous requirements of the clients, we are engaged in providing a high quality range of Dry Black Turmeric. It is used for curring Cancer, Aids, fertility, Menstrual disorder. We have pure and orginal black turmeric . We can supply black turmeric, salem turmeric fingers, mother rhizomes of turmeric, coleus dry roots. Whatever the nature has generated on this earth, it is not unnecessary. There are many things, which are ignorant about Today, we will tell you about some of the rare rare black herbs which you can use in your life to overcome a lot of problems and live a happy and prosperous life. The interesting thing is . .
We are the manufacturer of black turmeric.we are growing everthing organic on our farms in uttrakhand.Black turmeric contains the highest concentrations of curcumin of any plant species. It is a powerful antioxidant and anti-inflammatory. The root has been used medicinally for centuries to treat arthritis, asthma, and epilepsy.